What are Play Kitchen Accessories? Accessories are the souls of play kitchens. They are what determine if your kids will get valuable play time from their play kitchens. Without them, children’s kitchens are just ordinary toys, with no inherent value. But with accessories, a play kitchen is a lot much more. Accessories bring play kitchens to life. They offer your kids so many options in pretend play. It is accessories that release the creativity in your child. A kid can bake a cake in one moment and in another minute, he is preparing pizza. Not content with producing some of the most iconic play kitchens on the globe today, KidKraft, the award-winning toy company, makes some of the best accessory sets for toy kitchens. There is no doubt that they have the good of children in mind whenever they come out with a new product. Their toys are not only objects of entertainment but have been put together to help kids in all facet of growth. Here are some of the best KidKraft play kitchen accessories in 2018. The 115-piece KidKraft Tasty Treats Play Food Set is clearly the leader of the pack when it comes to accessories for your child’s kitchen. 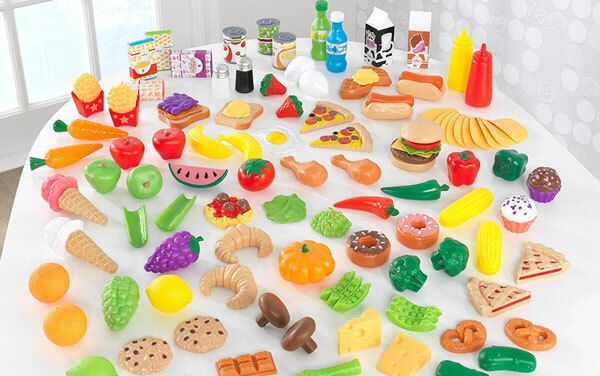 The uncommon high number of pieces makes sure your child never lacks choice of play food to prepare for the family. All the food groups were adequately represented. It includes play vegetables, fruits, pizza, waffles and lots more. The Tasty Treat items are not made of cheap plastic that easily gets squished when your child starts handling them roughly. There have been complaints from some parents that the quality could have been improved upon. But at its current price, we think this is a great value for your money. Plus, it will work well with all KidKraft kitchen sets and many other toy cooking sets. When it comes to toy kitchens, it’s not all about play food sets. You need quality play cookware that can handle the rigor of a child preparing food for mom and dad. Thankfully, KidKraft has got your back. The Deluxe Cookware Set consists of one metal pot with lid, two metal pans of different sizes, one metal ladle and one metal spatula. Though of kid-size, the design is so realistic that you can mistake these pieces for your own kitchenware. And KidKraft did not stop at that. 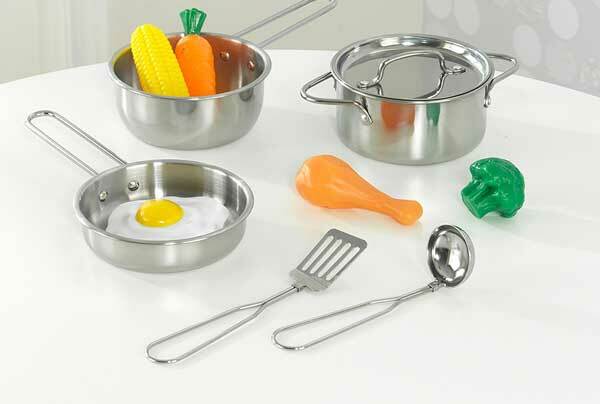 The Deluxe Cookware Set also comes with some pieces of play food – a chicken leg, one piece of broccoli, one ear of corn, one carrot and one egg. Cute is the word to describe this accessory set. KidKraft has been in the business of making toy sets for kids long enough to know that the best toys must first appeal to the kids. All the pieces, except the pot and pans, come in a set of four. These are not your typical plastic playsets, they are built to last. You will be amazed how kids love role-playing and the way they quickly get absorbed in the part they’re playing. To help your kids play the part of a chef successfully, you need to get them kits. One such kit, to make them look like real chefs is the KidKraft Tasty Treats Chef Accessory Set. 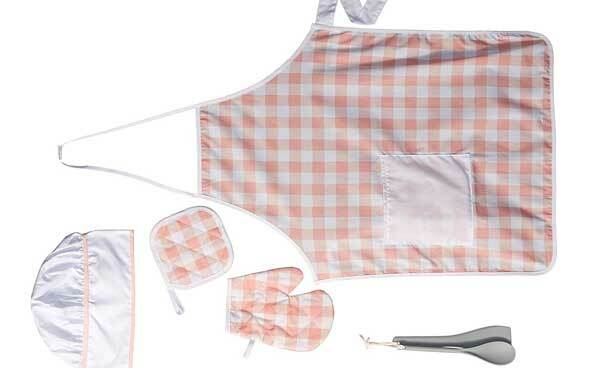 The Chef Accessory set features a chef’s apron, oven mitt and hat. It also comes with a mixing spoon, spatula and potholder. It is designed with multiple children sizes in mind, with 2 to 3 year olds wearing the apron by themselves comfortably. The Velcro in the hat also makes it adjustable for different sizes. The Wooden Cupcake Stand with Cupcakes is a beauty to behold. It’s hard to believe wooden cupcakes can look so tasty. 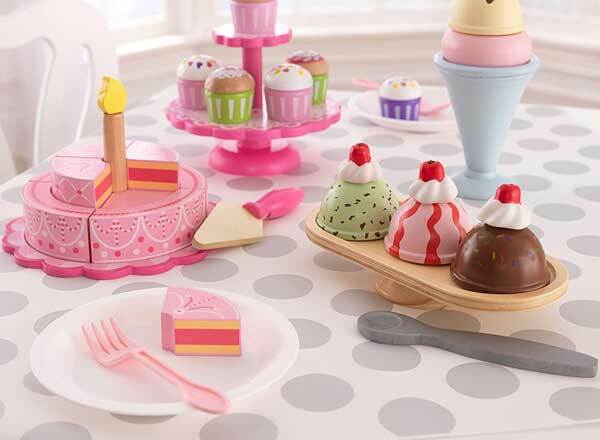 This set features six wooden cupcakes with a two-level cupcake stand. To create an additional play for kids, the top and bottom of each cupcake can be mixed and matched with others to form different color combinations. Your kid will certainly have fun setting this up and serving cupcakes to family and friends. With the high-quality finish and soft appealing colors, KidKraft ensures your kid will enjoy their play cupcake set for a long time to come. One offshoot of cooking that every kid should be encouraged to acquire is the baking skill. Baking offers children insights into how some of their favorite treats are made. And what better way to introduce your kids to baking than getting them the KidKraft Bright Baking set. 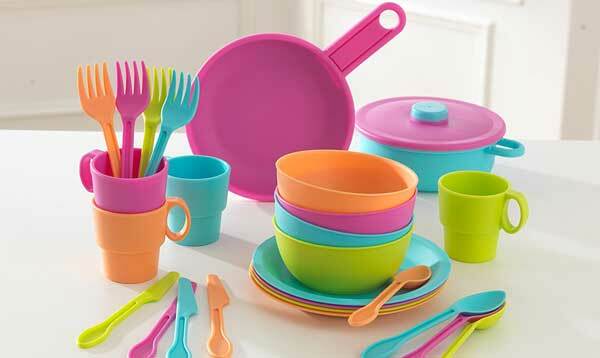 Having the Bright Baking set with their cooking set is enough to ignite your kids’ interest in baking. It resembles a real baking equipment in a lot of ways. The mixer head can be tipped back to allow the mixing bowl to be put in place or removed. 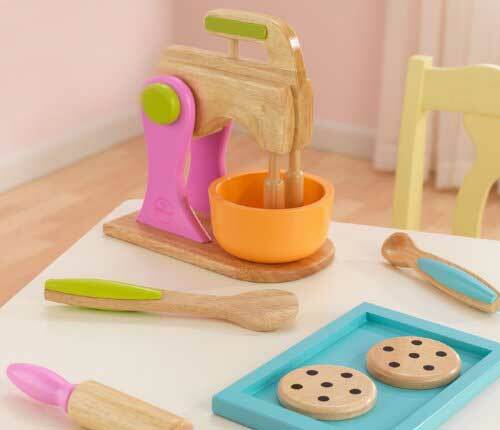 The quality wood with this set is made from will ensure it survives your kids’ pretend baking and handling. The set consists of a beautifully-designed wooden mixer, a mixing bowl, a rolling pin, a spatula, 2 chocolate chip cookies, a measuring spoon and a cooking pan. One benefit of play food set is that they allow kids to explore their creative side. Not many moms will give to their kids to play with a pizza they planned to eat. But a play food will allow him to carry out his creative imaginations. Another thing is, there is an opportunity for parents to teach their kids about a particular food item or food group. The KidKraft Pizza playset is a wonderful tool not only to teach your kids the proper way to cut up a pizza but how is prepared and served. It comes with a lot of pieces, numbering 26, each play item offering your kids opportunity to know where it comes from. There are four pizza slices, made of wood which your kid can pretend serve to members of the family. There are 12 felt and 10 wood toppings. With these, you can explain why and how food items are combined. The Pizza set also comes with a plastic pizza cutter, parmesan packets, spatula and wooden pepper. Check the accessory set you’re looking to buy. If it contains too many small pieces, don’t buy it. Tiny part can pose a choking hazard to kids. You should always look out for BPA-free sticker too to make sure your kids are safe from toxic items. In addition, to make sure your kids get maximum value from their play kitchens, make sure you get accessories for different play recipes. This is what will ensure they do not get bored with doing the same thing over and over again. Play kitchen accessories are the pieces of cookware and utensils that are used with a play kitchen. In the real kitchen, we have plates, pots and pans. We have spoons, knives and forks. We have gadgets that we use in the kitchen to assist in preparing foods and makes our lives easier. These are accessories. For your kids to get the most value from their play kitchen, you should buy accessories to be used with their play kitchens. Many play kitchens already come with a set of accessories. But in most cases, these are not always enough. Kids generally will want to prepare the same dishes their moms prepare on their own kitchens, which will make the accessories each child needs somewhat plentiful. There you have it, a buying guide to the best KidKraft Play Kitchens accessories out there. 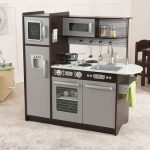 All of the playsets mentioned here will work well in most KidKraft kitchens. You will also find some working on many other brands too.